Pontevedra based Industrias Abalde is a manufacturing company of light metal structures, such a small boilers, components for lifts and other elevating systems. They work for an ample range of sectors including waste management, the naval construction and the food industry. 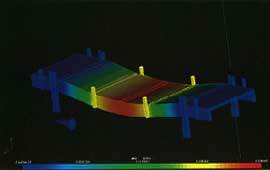 PROJECT:Stress-strain mechanical analysis of a lifting beam. GOAL: Obtaining the optimal lifting points. Industrias Abalde, with the support provided by CESGA’s supercomputing resources, applied CloudPYME technologies to calculate the lifting points and the heaviest load supported by a long span beam produced at their premises. This enterprise’s main activities are designing and producing nautical related instruments and systems, drilling and industrial equipment, maintenance and technical support for the civil engineering and mechanical industries. 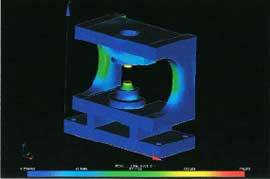 PROJECT: Stress-strain mechanical analysis of a pulley-block. GOAL: Identifying the critical zones of the lifting hook. Working with CESGA enabled Industrias Ferri to find out the stress-strain effects one of their standard products, a pulley used for lifting heavy loads, undergoes during its function. The simulations proved to be fast and effective thanks to the supercomputing resources CloudPYME offers. Also, thanks to cloud computing, their in-house equipments were available for other tasks while CESGA’s 1200-core supercomputer managed the complex calculation quickly. This Galicia based corporation is specialized in the development and implementation of transport systems, and modular and reconfigurable storage. With over 25 years of experience, ESYPRO holds R + D + i as a dear value and paramount for their future. 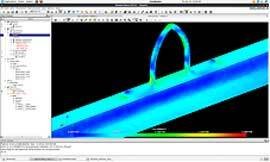 PROJECT: Stress-strain mechanical analysis of a steel strap for a suspending brace. GOAL: Selecting the right material (steel grade). 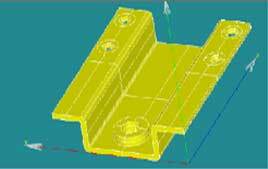 For the project, a virtual stress-strain analysis was conducted on a supporting piece for a steel brace. 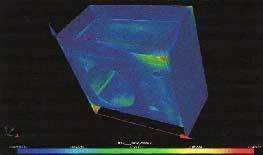 With this simulation, the critical areas of the piece were tested under different structural loads and conditions. The results allowed ESYPRO team to apply changes on the design and materials used, since the initial parameters of the piece were shown to be insufficient to successfully accomplish the task for which it was intended. Ronaútica is a company established in 1987 devoted to many endeavors such as designing, manufacturing, and installing harbors and floatable platforms, and yacht building and maintenance. PROJECT: Stress-strain mechanical analysis of a steel strap for an underwater lug. GOAL: Determining the thickness for the metal sheet. CloudPYME was used to run the tests for showing the strength of a bracket that must withstand a force of 10,000 N. used in the installation of a floating pier. In order to witness first-hand the benefits of high performance and cloud computing, the finite element analysis of the piece was performed in Ronaútica’s in-house computers and CESGA’s supercomputer at the same time. Using CloudPYME resources result in a dramatic decrease of time while liberating the RAM memory of their computers for other purposes. Coruña based Texas Controls is a leading designer and manufacturer of technological equipment with extensive experience in producing clamping and sealing, high pressure and auxiliary mechanical equipment. They are also experts in the field of hydrogen technology and wind prospecting. 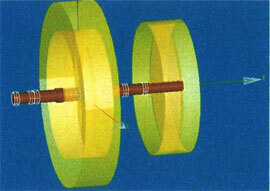 PROJECT: Evaluating the behavior of a joint rotating coupling under pressure. GOAL: Gather knowledge for solutions to possible leaks in the process. 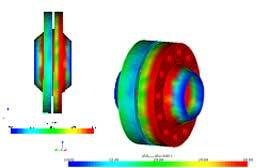 Processing and numerical simulation software hosted by CloudPYME, Code_Aster and Salome, enabled Texas Controls to obtain the levels of mechanical stress and deformation undergone by two flanges and a gasket. Defining the critical pressure was key important for the correct union of the set of pieces. TUFAMA has established an important presence in the metal mechanic and petrochemical industry through the production of metal structures, equipment and stainless steel pipes. PROJECT: Stress and deformation mechanical analysis of a metallic waste disposal platform. GOAL: Optimizing the weight loads the piece can be subject to. Thanks to the resources for modeling and simulating contained in CloudPYME, the Portuguese company was able to calculate the stresses and strains undergone by a metal bridge used in the management of waste material. The project meant TUFAMA’s first contact with finite element analysis (FEA) model tools and technologies. Via application tutorials about the virtual machines that CloudPYME makes available to its clients, project managers gained the skills necessary to accomplish the project initial objectives. Vale e Quintão works in the design, maintenance and production of steel structures for domestic and industrial applications. PROJECT: Evaluation under pressure of a fixed beam used in a food production machine. GOAL: Identifying maximum pressure and weight supported by the structure. CloudPYME enabled Vale e Quintão to examine the effects that pressure and weight have on the structure that holds a machine used in food processing. The company’s mission is to design, manufacture and install powered industrial equipment to lift and move materials (forklifts, lift tables, platforms and presses). PROJECT: Evaluation of the resistance of the juncture between a hydraulic lifting platform and a forklift. GOAL: Determining the stress concentration on the structure. The project aimed at finding the resistance of the assembly between a hydraulic lifting platform and a forklift. This process was divided in two phases. Firstly, the so-called “groups” were created in Salome to tell apart the different physical components of the design. Secondly, a post processing analysis showed how stress concentrations act upon the structure. The presence of a reinforcing seat proved decisive in dissipating the pressure resulting in a better distribution of the efforts. Esmeriz based company, Marques e Cruz has over 30 years experience manufacturing a wide range of industrial machines for multiple sectors (wood, textile, metal mechanic …) as well as producing components and automatic equipment, while offering technical support and restoration for this. PROJECT: Stress-strain mechanical analysis of a metallic rod connecting a pulley and a grinding wheel in a belt grinder. GOAL: Identifying the deformation limits of the shaft. 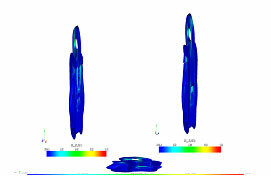 A static finite element simulation performed after applying the geometrical grid to all elements with Salome made it possible to determine the deformation affecting the shaft. In this, the forces exerted by the belt on the pulley and the limes on the whetstone were taken into account. 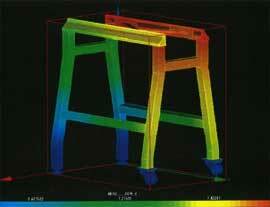 PROJECT: Stress-strain mechanical analysis of a two-storey bunk bed structure. GOAL: Selecting the right type of wood in base of the weight loads. Technicians in Carpinteria Domingos modeled the design of a two-storey bunk bed manufactured by them in order to find out the tensions and deformations undergone by wood when there is one person at the bottom, the top and the steps accessing the latter. The results guaranteed the robustness and suitability of the structure for its function. Using CloudPYME HPC tools was Carpinteria Domingos’ first approach to supercomputing. Nevertheless, tutorials and a user friendly interface helped our clients to develop the project successfully. Satisfaction levels were high so collaboration in the near future is expected. 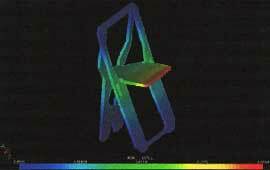 PROJECT: Determining the robustness of an already marketed folding chair. GOAL: Identifying improvements in the design of the joint between the plate and the frame. Weproductise tested the strength and resistance of a folding chair produced and marketed by them. The analysis found that the stress in the seal between the plate and the frame could be remarkably high. Thanks to this, next models will show a more uniform contact area between the above mentioned parts in order to distribute tensions more efficiently. This case embodies a practical example of how supercomputing and cloud technologies promote creation and innovation, while improving the processes involved in several branches of industrial production. Prova Engineering designs, manufactures and ensembles machines and tailor-made equipment for several industrial sectors. PROJECT: Mechanical analysis of a hydraulic press support system. GOAL: Determining its behavior under pressure. The study dealt with the support of a hydraulic press used for cutting off metallic pipes, a component of a machine produced by the company. After applying the grid through Salome, calculations of pressure on the structure were processed using ASTK in CloudPYME work station. This pilot project revealed that the structure studied is slightly over dimensioned for the range of pressure that it is subject to, thus allowing Prova Engineering to refine the design of the piece in those areas where tensions concur.